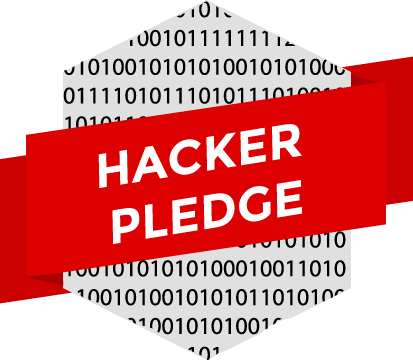 The Hacker Pledge is a public commitment from a company to provide a hacker-friendly workplace for its employees so they can thrive and continue improving their skills, to their common benefit. If you want to be one of them, see below How do I support The Hacker Pledge? Does this pledge have any legal status? No. Still, it represents a strong & public commitment towards a hacker-friendly culture in the workplace. So what is the value of this pledge? It shares most of the values of the hacker community. It is actually capable of coming out publicly to support them. Some large companies sunk in bureaucracy wouldn't be able to. As a company, how do I support the pledge? After doing so you will be added to the public directory of companies supporting the pledge. Check back here for updates! As a hacker, how do I support the pledge? The 0.x version of this pledge was drafted by the dotConferences team with input and feedback from a large group of developers. The 1.0 version was first announced publicly on May 19th, 2014 with the goal of being a living document based on a broad consensus from the hacker community. Why did you create this pledge? There are too many companies where executives are not educated towards the benefits of rewarding curiosity, initiative and openness from their employees. We think it is mutually beneficial to have a hacker-friendly workplace and we hope to set a baseline for what this actually means. We believe that taking the pledge and following its principles will help teams be happy and do the best work they can. Shouldn't inclusiveness and non-discrimination be part of the pledge? Everyone (not just hackers!) should be treated without discrimination regarding gender, ethnic minority or beliefs. This pledge is non exhaustive and puts emphasis on the principles that are at the core of the hacker spirit. Why don't you mention comfortable chairs? Same reason. The health of a hacker is not more valuable than any other employee! Who can I contact if I have feedback or questions on the Hacker Pledge? We will get a panel of highly respected hackers to act as moral authority in case of unresolved debates.